Also when it comes to combining multiple room divider screens. Our room divider, Facet, is a modular system meaning you can customize it to suit your particular needs. It comes in many different sizes. It also means that they can easily be combined with each other. Hang your two room dividers up side by side to form a dazzling barrier between two spaces that you want to split up. Or perhaps a passageway like it this showcase. Using two room dividers is absolutely ideal for the instances where you need to section off a certain area while keeping the feeling of open plan design in your interior. The space that needs to be separated becomes isolated, while still offering a glance at the rest of the room. With two room dividers installed next to each other, you give your interior a one of a kind look. The screen is adjustable, so you can create the effect you are looking for. These panels are both versatile and functional. They work equally well in a small space as in a large space. Whether you only need a small partition or to form an entire wall between two rooms, Facet will fulfill your wishes. When designing a showroom, for instance, you can opt for completely closed off spaces by means of solid walls. This, however, tends to give viewers a claustrophobic feeling and does not allow for interaction between the different rooms. 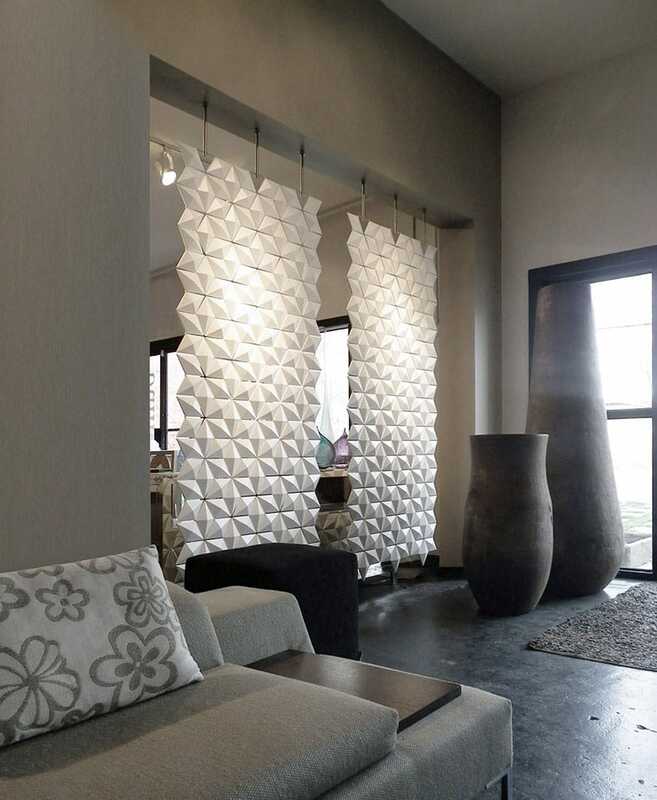 An alternative to the traditional showroom arrangement is to make use of two (or more) room divider screens. By using two room dividers, you separate different spaces in a fresh modern way. In a showroom setting, for example, you give your customers a glimpse of what is waiting around the corner and in a restaurant setting, for example, you give you guests some privacy without closing them completely off from each other. With Facet, you have an additional feature – the possibility to play around with light and shadow. You can personalize and adjust the transparency of its surface. This is what makes our room divider screens unique. Each diamond shaped part can rotate, giving you the possibility to decide how much of the next room should be visible. You can create a striking pattern with two room divider screens with shades ranging from completely opaque to completely transparent. And if you change your mind about the amount of transparency, just flip around the diamond element to your liking or current mood! You can mount room divider Facet to any type of ceiling. Our step-by-step guide ensures easy installation and our outstanding personal support will assist you if necessary. Do you have any question? Feel free to contact us by phone or send us a message. We are here to help you out! The two room divider screens in the picture above are installed in a beautiful showroom in Calgary, Canada. It brings an exquisite element with its geometric shapes while dividing the showroom in a subtle way.